Goal of the brainstorming was to define future activities of the EFMC and to build a roadmap how to promote medicinal chemistry within Europe at a time where we see unprecedented changes in the life science enterprise. The stimulating discussions, held in a good atmosphere were very fruitful. Ideas came up, proposals were collected and working groups have been established, translating creativity and lateral-thinking into concreteness. The Executive Committee and the working groups now take up the challenge to implement the proposals, taking concrete actions both in the short and the long run. Let’s talk a bit with the President of EFMC, Uli Stilz, who was the main promoter of this initiative to appreciate more the outcome of the workshop and to foresee the expected evolution. Q. Uli, let’s start with something provocative. Was there something wrong with the current organization of EFMC, and why did you decide to organize such a demanding workshop? Gabriele, it was very important for me to create an opportunity to bring together EFMC key stakeholders including the Council, the various committee members and the next generation of leaders to engage in a dialog about strategic initiatives EFMC needs to push to best serve the medicinal chemistry community in Europe and across the world in times of unprecedented change in the life science enterprise. In my view, there is nothing wrong with the current organization of EFMC. Nevertheless, I strongly believe that it is critical for any organization every once a while to step out of the day to day business to clarify what we do very well and want to keep doing going forward and also to reflect what new activities are required in a rapidly changing environment and how to make those new initiatives happen. Q. How did you like the commitment of the people who attended the workshop, and do you think this initiative will have also impact on the national member society activities? 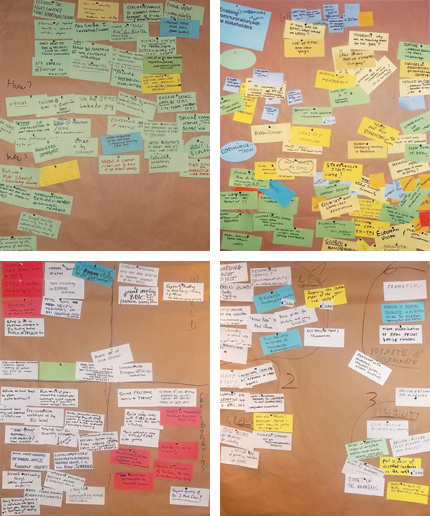 We have designed the workshop in Frankfurt in the format of a “World Café” to foster creativity and participation. Personally, I was very impressed by the energy I felt in the room during the workshop. We are off to a great start both from the spirit among all participants to drive EFMC activities together in the future and by the significant number of great ideas and initiatives which have emerged out of the workshop. Concerning your question on the impact on national member societies I expect that the workshop has contributed to strengthen the network between individual members and that this will foster information flow and joint initiatives across member societies. Just as one example we have discussed to share training materials across the different Medicinal Chemistry Schools we have currently in the various European countries. Q. What are, in your opinion, the most relevant outcomes of the workshop, and did you expect something more, or something different at the beginning? During the workshop we have identified a number of major new initiatives for EFMC, which we want to implement during the next 2-3 years. These initiatives include improved stakeholder management at the European level, various activities to strengthen the visibility of Medicinal Chemistry in Europe including the use of social media to better communicate within the scientific community and with the broader public, collaborations with other scientific societies and a new scientific meeting we will implement for young scientist to promote and support their career development. My personal priority for the workshop was to join and listen to the ideas and proposals brought up by the participants during the two day workshop. The workshop has helped me a lot to have a much clearer sense of what are the most pressing issues we need to tackle. In some way I was overwhelmed by the energy and commitment all participants have put into the workshop. This was a wonderful experience. Q. Now, the most challenging part is to follow-up the workshop by concrete actions and initiative. How do you see the interconnection between the workgroups and the EC? We have implemented small working groups to drive implementation, and the EC also decided on a few quick-wins. Right after the workshop, we have created an EFMC twitter account and we changed the age policy for prize winners. It is critical for me that we keep the spirit of the workshop in Frankfurt to manage and drive EFMC as a community. In my experience a dynamic and vibrant community benefits from decentralized structures. The EC and EC members can and must play a major role as enabler and facilitators and as a management team I would also like us to keep track of where we are with the initiatives and to communicate and celebrate the progress we make. But I also want to emphasize that by no means I want the EC to function as a gate keeper. Q. To finish, I would like your comment also on the technical aspects of the meeting. My personal opinion is that the brainstorming was really great, and I had the very concrete feeling that inspiring discussions and lateral-thinking can only blow up from a structured environment, and, it can seem an ossimoric statement, but a lot of organization is needed to promote creativity. Maybe people coming from industrial environments are more accustomed to this than academics, but can you comment on this? Gabriele, this is a very good observation you are bringing up here. It resonates with my experience that highly creative teams appear only on the surface a bit “chaotic” but at a more close inspection follow a very well defined process with different team members taking on well defined roles. We have tried to build some structure into the design of the “World Café” workshop and I hope participants have enjoyed the experience of the two days being together as much as I did.